Asteroids, comets, meteorits: a danger for Earth? Some comets are broken abruptly by a close approach of a planet due to the gravitational forces. But apart from these exceptional events, a comet periodic naturally looses 0 to 1% of its mass (0.3 to 0.4 magnitude) at each perihelion passage. The cores, made ​​of a brittle material can break at various heliocentric distances: ejected fragments become meteoroids on neighboring orbits of those of the original comet, and some core nuclei may form the asteroids Apollo or Amor. It seems that in most cases the nuclei dissipate completely giving rise to meteor swarms. The orbits of dust grains from a periodic comet s differ slightly from that of the comet. Those ejected from the sunny side of the nuclei fall on a smaller orbit and are distributed forwardly of the core, while those that are ejected from the opposite side of the Sun go to the rear. After a few tens or hundreds of years, and as a result gravitational perturbations, the solid particles are distributed over the orbit and form a ring of cometary debris. Later still, that ring becomes diffuse because of collisions between grains, or because of the Poynting-Robertson effect due to the loss of angular momentum due to the re-emission of the solar radiations. Grains gradually leave the initial swarm to be diluted in the interplanetary medium. The following table shows the main characteristics of meteoroid swarms which may give rise to visual meteors every year at the same period. It gives the periods of activity and an estimate of the date of the maximum activity and its value. This value is given in the form of zenital hourly rate (ZHR) corresponding the number of meteors per hour expected in a place where the radiant is in the zenith and under ideal conditional observation. It should be noted that the predictions of the meteoritic activity are difficult to perform because they involve knowledge of the structure of the current of the swarm and non-gravitational effects acting on their evolution that we do not have perfectly. Characteristics of the main meteoritic swarms. but are valid for the other following years . When a swarm encounter the Earth's atmosphere at a speed between 11 kilometers per second (rate of release) and 74 kilometers per second (maximum speed observed speed for bodies belonging to the solar system), the fragments of solid material heat up and burn in dense layers of the atmosphere between altitudes 110 and 70 km. Then one will see meteors, poetically called shooting stars, which appear to come from a single point of the celestial sphere, the radiant. When the swarm is young, cometary debris are gathered on a portion of the orbit, the atmospheric luminous phenomenon lasts only a few hours and the hourly rate of meteors is high. 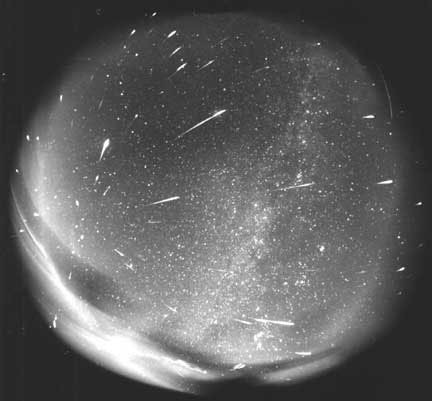 The shower of shooting stars is reproduced with a frequency controlled by the period of the generator comet: this is then called a periodic meteor swarm. This is the case, for example, coming from the Giacobinids coming from the P/Giacobini- Zinner comet, or Leonids, the radiant of which being in the constellation of the Lion, and which are derived from the comet P / Tempel-Tuttle. If the swarm is old, debris are diluted throughout orbital ring and the phenomenon may last a few days, with very little hourly rate. The shower occurs every year at the same time, and we talk about permanent meteor swarm. 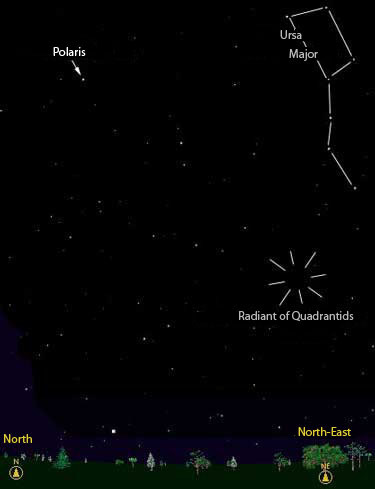 This is the case of the famous Perseids in August associated to from P / Swift-Tuttle , also the Aquarids at the beginning of May or the Orionids at the end of October which are derived from P / Halley. The debris that cause these meteors are called meteoroids and those arriving to the ground, meteorites. The smaller (size near a micrometer) are slowed by the atmosphere without being destroyed, the heat made by friction is insufficient to raise the temperature to boiling. Meteoroids with a mass included between 10-7 gram and 1 kilogram are destroyed in their passage through the atmosphere. Finally, there are bodies, more than one kilogram mass arriving to the ground, more or less broken and burned, after losing a fraction of their mass through the atmosphere; these large meteorites, of stony or metallic nature, may be rather asteroidal origin, so that if we really want to know the composition of the cometary nuclei, we must send spacecraft to meet them. 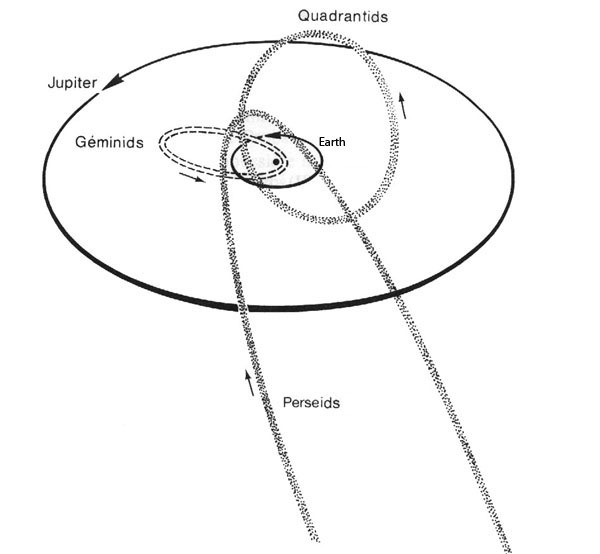 Orbits of three meteor swarms, responsibles of meteor showers whose characteristics are given in the table above. These swarms are generated by long periods comets (Perseids) and short periods comets (Quadrantids and Geminids).